Dog parents are tired of filler-filled treats! That is why Bimini's Best Dog Treats aremanufactured with onlyhuman grade ingredients and are also Gluten-free, Low-fat, Soy-free and Corn-free! Bimini LLC’s mission is To provide pet parents with high quality products designed to enhance and support the health of their pets for a better quality of life. Our company was built on the founding principles of bringing advanced scientific knowledge and all natural ingredients to producing high quality supplements and health treats to support the health of our beloved pets. Our products are manufactured using eco-friendly practices right here in the USA. Our formulations are built by experts relying on extensive research and experience to produce highly palatable and effective supplements and treats that your dogs and cats will enjoy and benefit from. We love what we do and hope that you will love our products. and help lubricate the joints. Senior Dog unable to do regular walks, back to walking with Bimini's Dog Hip and Joint Treats! Blueberry/Banana treats are made with organic oats, organic blueberries and organic bananas with the addition of the antioxidant nutrient vitamin E. They are gluten-free, Low fat, soy-free and corn-free. Peanut Butter/Honey treats are made with organic oats, organic peanut butter and organic honey with the addition of the antioxidant nutrient vitamin C. They are gluten-free, Low fat, soy-free and corn-free. Apple/Cranberry treats are made with organic oats, organic apples and organic cranberries with the addition of the antioxidant nutrient vitamin E. They are gluten-free, Low fat, soy-free and corn-free. Our Sweet Potato/Apple treats are made with organic oats, organic sweet potatoes and organic apples with the addition of the antioxidant nutrient vitamin E. They are gluten-free, Low fat, soy-free and corn-free. All flavors are available in petite and regular sizes. What Sets Bimini Best Dog Treats Apart From Other Dog Treats? Bimini’s Best Dog Health Treats contain no fillers and are made with only three human grade organic ingredients, a vitamin (either vitamin C or vitamin E) and no animal products or byproducts. The health treats are also Gluten-free, Low-fat, Soy-free and Corn-free and come in four tasty flavors. The available flavors are Blueberry/Banana, Peanut Butter/Honey, Apple/Cranberry and Sweet Potato/Apple. Bimini’s Best Dog Treats come in two sizes catering for all dog sizes and the calorie content per single treat ranges from 9-15 calories only. Bimini’s Best Dog Health Treats are made and packaged in the United States. How Often Can I Give My Dog Bimini Dog Treats? Bimini’s Best Dog Health Treats can be given as often as needed but should not exceed 10% of the total calorie intake for the dog on a daily basis. What Do Customers Say About Bimini Dog Treats? I have three Belgian Malinois and two Cardigan Corgis. Of the five dogs, three have no preference, they loved both the Blueberry/Banana flavor and the Peanut Butter/Honey flavored treats, equally. My female Malinois preferred the Blueberry & Banana flavored treats, and my 10 yr old male Malinois preferred the Peanut Butter & Honey flavored treats. I like the fact that they have human grade ingredients, and are USA made. I am so glad your products were brought to my attention. Louie & Karma Jean LOVED the blueberry & banana dog treats that I bought off of Amazon.com. I have a few different types of treats, and typically make my own since you never really know what is put into dog food these days. However, finding Bimini's treats is like finding gold! They are all natural, made from organic foods, low fat, soy and corn free, and most importantly, gluten free. They are also made here in the U.S.A.! Way to go Bimini! I purchased both flavors of treats. Wow! My dogs absolutely love them! Last night my lab-mix was barking at the cupboard where we keep them. My greyhound has been a bit more subtle; she simply came and got me from the bedroom, walked me into the kitchen and led me to the cupboard. It was like she was Lassie, and Timmy was down in the well- she kept turning around to make sure I was following her! She's definitely not the chow hound, and is actually pretty reserved most of the time, so for her to do this was really funny! I think Bimini's got a pretty tasty snack here! Order Your Bimini Best Dog Treats Today! Make sure that your dog has treats that are both delicious AND nutritious! 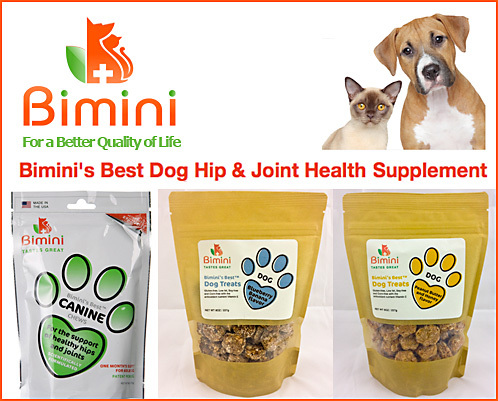 Bimini's Best Dog Treats can be found at BiminiPetHealth.com, Amazon.com and retailers near you. Be SURE to ask YOUR store for Bimini's Best Dog Treats when you shop. For more information about our delicious dog treats, please call us today!